If you found an ERROR, kindly email to racewalkermalaysia@gmail.com for amendment. Number collection is on 6/12/2014, Saturday (2.00pm - 7.00pm) at Dataran Seremban (view here). 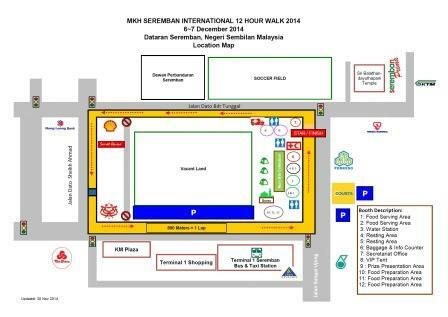 Please arrive EARLY to find your best parking spot (Next to vacant land RM7.00 Per day) and to AVOID traffic jam! RM95.00 - Before Nov 23, 2014 - Extended! Walkers who wish to submit their entry forms by hand to RWAM office. You may submit it to No 39, Jln SS5A/6, 47301 Petaling Jaya. Entry forms can be photocopied. Soft copy can be downloaded from this page. Please make payment before submitting to the RWAM office. Either by Online transfer/Cheque Deposit/Cash Deposit to RWAM Maybank A/C. Submit your original payment slip and entry form to us. Keep a copy of payment slip and entry form for your own references. Receipt will be issue upon request. Bank Branch Address: No. 100, Jalan Tun Perak, 50000 Kuala Lumpur.